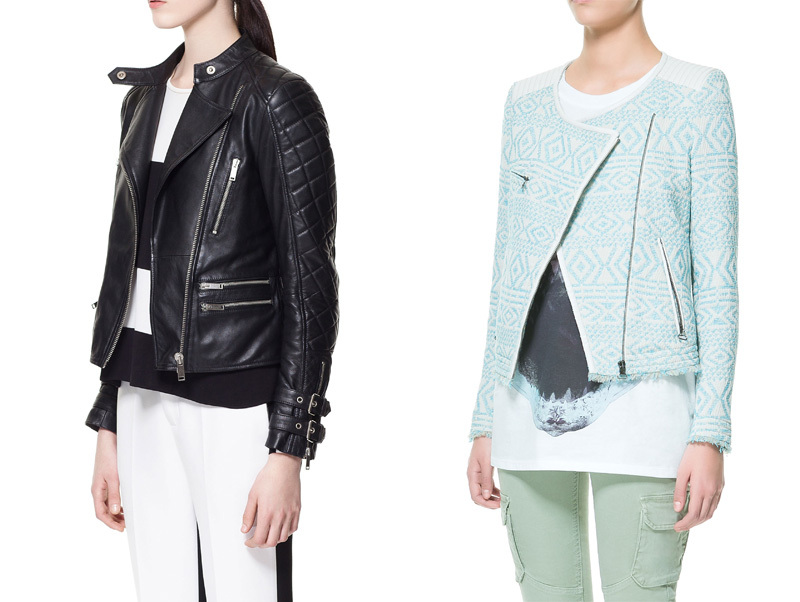 Today's post features the top picks, available now, in the biker jacket category — a.k.a. a peek into my own wishlist. I absolutely adore biker jackets and feel like myself whenever I'm wearing them, if that makes sense. You know when you're wearing something, just because you followed someone's advice, go out and feel kind of awkward and uncomfortable? And, of course, that's when you bump into someone you haven't seen in years. Hah! I rarely do that now, I just wear what I want, because I dislike the feeling that I'm not transmitting my true image/personality through my outfit. Last Christmas, I got a pair of lime green gloves with a pink trimming. And they were seriously soft and good quality. But I didn't have anything that would look good with them. Also, I'd probably hide my hands in my coat pockets. So I carried on wearing my bottle green leather-look gloves with cut-outs. Much better. Or, the time I got a necklace from my work colleagues, and didn't want to hurt their feelings, so I wore it the next day. Not that it wasn't pretty, just wasn't my style. Basically, I felt weird for the whole day because I had it on. Anyway, on with the jackets. The first two are from Zara — which isn't a surprise coming from me, is it? The one on the left has a nice quilted effect on the arms and quite a few zips, which I really like. The second one, has more of a spring feeling — softer material, paler shade and a fun print. Next, a couple of options from Topshop. The first has a really unique lapel in a contrasting colour. It's ideal to combine with a black outfit, providing a little visual interest. The white jacket has a subtle quilted effect just on the top of the arms and buckles on the waist. Again, the leather-look and some extra zips make me happy. The final two can be found on ASOS, and these specific models are a bit more pricey than the previous ones. But, take a look on the website and you'll find different price ranges and designs. 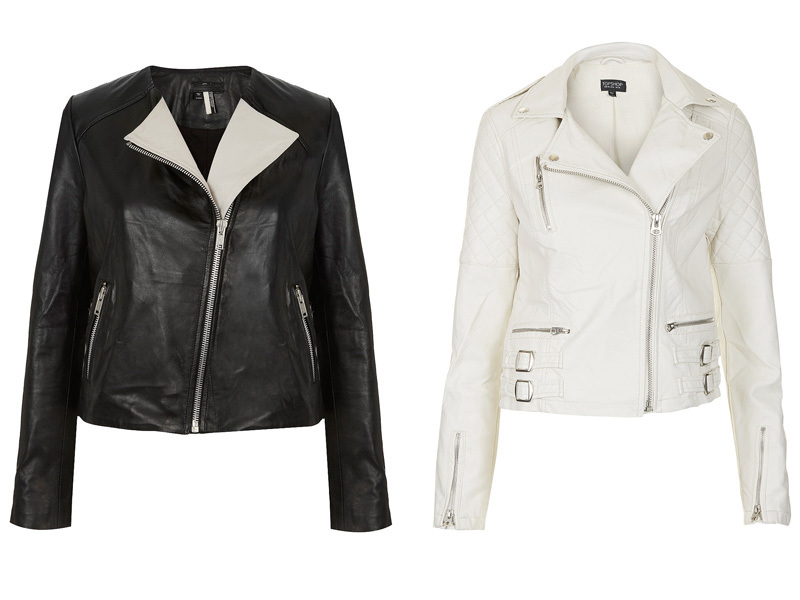 The first choice is a cream leather jacket with a pretty standard style, when it comes to real biker jackets — zips, pockets and a belt on the waistline. The lighter shade makes it more fresh and versatile to combine with various clothing items. The one on the right comes in a beautiful and rich berry shade, with a zip on the arm — nice detail there — and the perfect length. Now the difficult part: which one should I go for?